Serves as many as you can make. I call these Italian Deli Lettuce Wraps because I tried to capture the delicious flavor of the grinders (subs, hoagies, heroes, etc.) made in the Italian delicatessens where I lived in New England. Arrange the large leaves of Romaine in an overlapping pattern toward one corner of a sheet of parchment paper or waxed paper. Place some shredded lettuce on the Romaine and garnish with a little olive oil. 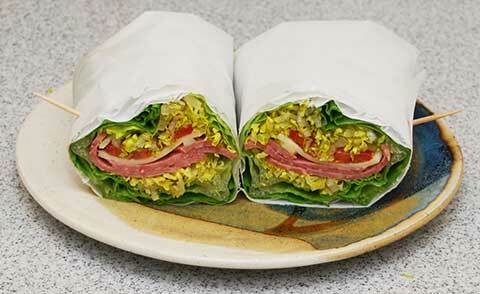 Arrange the salami, cheese, tomatoes, avocado and more shredded lettuce on top. Season with salt and pepper. Drizzle with more olive oil. Starting at one corner, roll up the wrap, enclosing the filling and wrapping tightly (being careful not to tear the paper). Tuck in the sides as you wrap. Use toothpicks to secure the final edges of the paper. With a sharp knife (a bread knife works well), cut the roll in half. Arrange the pieces on a plate and serve.